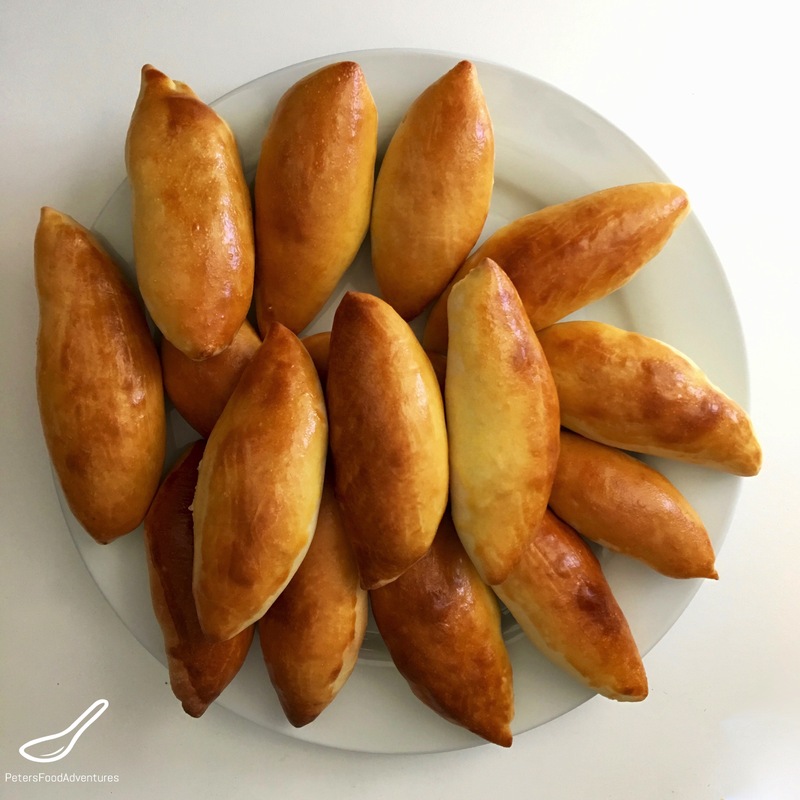 Pirozhki is simply the plural form of the Russian word pirozhok, meaning small pie. This recipe is a bunch of small meat pies. They are also sometimes called pirozhki, or Pīrāgi, depending of what part of Eastern Europe you’re from. They were common around the USSR are now commonly found across Central Asian countries like Kazakhstan. In today’s day and age, we will be using a regular electric oven in my kitchen, and my Cuisinart Bread Maker and it’s handy dough setting to make baked pirozhki. It’s such a time saver to throw in the ingredients to my bread maker and in 90 minutes, I have yeast dough, ready to use! I’d be lost without my bread maker, which I really only use the dough setting. I’ve tried several different variations of dough via a bread maker and think this version is perfect! We grew up eating several different variations of Piroshki, depending on the filling. It can be savoury with meat, beef and potatoes, cabbage or made sweet with fruit fillings, like Blueberry Piroshki. We also often made Fried Piroshki which are delicious too! Check out my different Piroshki recipes on my site. This is the classic baked beef pirozhki with onion recipe, which is so good. As kids, we would eat it with Ketchup, not so traditional, but I suppose Heinz Ketchup has invaded everywhere. If you’re going through all the work of making this recipe, double the batch and freeze what you can’t eat. After the dough cycle is complete, remove the dough and start the second batch while you make the piroshki. They freeze perfectly to pull out for a quick delicious snack, or enjoy them alongside your homemade Shchi cabbage soup. This is another high carb Russian comfort food I could eat everyday, but if I did, I would need to be careful not to become a giant pirozhok. Bon Appetit! Приятного аппетита! In a frying pan, over medium high heat, the ground beef until cooked and evenly browned. Add onions and continue to fry until translucent. Add salt and pepper, taste and adjust if necessary and set aside to cool before adding to the dough. When the dough is ready, carefully place onto a very lightly floured surface. Roll out the dough into a long sausage shape. You want to cut into pieces that are approx. the size of a golf ball. Or you can pinch off golf ball pieces from the dough. You should get at least 24 pieces from this recipe. Cover pieces you aren't working on with cling wrap so they don't dry out. Roll out the dough balls as thin as you can into the shape of an oval. Place about 1 tablespoon of the filling in the centre. Pinch both sides of the edges of the dough together, creating a seal all around. Don’t allow the filling to touch the edges or the seal will come apart. Place the piroshki on parchment paper, or a lightly greased baking tray, upside down, so you cannot see the pinched seal, and flatten them a bit. Don't allow them to touch each other, as they will stick together. Make the egg wash by beating the egg yolk with 1 teaspoon of whipping cream and brush the piroshki with the egg wash before putting into the oven. Place into the oven and bake until golden brown, about 15 minutes. It’s so good, it doesn’t last long in our house! I remember having these in a joint in Chicago 25 years ago… Delish! It’s amazing how food can bring back memories of places and things! Pockets full of deliciousness, Peter! Bravo! Thanks Lana! haha, that’s a great way to describe them!!! Something I keep meaning to make for the boys as they are snacking even more lately! You’re right! Such a great snack! I put a Ziploc bag in the freezer today of piroshki! ???? I had a Russian girlfriend whose mum used to make these and they were delicious I have always wanted to make them..I have however never seen a recipe that included glass noodles? I a man assuming that glass noodles are rice vermicelli noodles? Can anyone direct me to such a recipe or perhaps know what they are? Hi Sue! Thanks for checking it out! Yes, my mum sometimes used glass noodles or rice vermicelli noodles. Actually it was Bean Vermicelli noodles she used, looks the same just doesn’t get as mushy as the rice noodles, just read the package ingredients. The recipe is the same as above (for baked piroshki but also works in fried) you just need to add some softened bean vermicelli noodles to the ground beef mixture. Follow the rehydrating instructions on the packet and then drain the noodles well. Add the the beef and onion mixture with a ratio you are happy with. I haven’t seen a recipe out there, I will add it to my blog list. Thanks Carmen! I also love the fried ones, will post that one too!